It’s time to celebrate! Let us count the ways . . . .
Download, print and display this year’s poster. List and find your group’s or area’s poetry-related events. Attend a poetry open mic or poetry slam event. Put on your poetry-writing contest face for the local library or calls for poems from literary and news publications. Learn how to read and study poetry like a pro! Track down and read the work of that poet you keep hearing about. Students and teachers, check out Poetry 180, the Library of Congress project of former U.S. Poet Laureate Billy Collins. Learn about the national recitation contest Poetry Out Loud. Empty your pockets so they may be blessed with the bounty of beautiful verse on April 21, Poem-in-Your-Pocket Day. Get out and poeticize (it’s a word, I swear! poets can make up words, too) nature, politics, facebook, school, the arts, work, your wardrobe, jelly beans, your car, that bad hair day, dust bunnies, March Madness, tattoos gone wrong–whatever! Pen a song, write a rap, craft a poetic recipe, or make your own poetry crossword puzzle. And if you’re ready to publish, check out guides such as 2016 Poet’s Market. Worship words, savor sounds, lather up your language, make music, praise poetry. Gear up for the verses. Here are my blog’s 10 top-viewed posts in poetry. April is National Poetry Month, time to celebrate. Let us count the ways . . . . Welcome back to those of you who’ve been chomping at the bit all week to learn the answers to last week’s FPF Quiz! And welcome all to this weekly festival of phrase frolic I call Five-Phrase Friday. Caution: This post is for mature (or extremely immature adult) readers only. Last week, we galavanted through grammar, bawdy Shakespearean insults, and similar phrases from the Starz TV show Outlander. This week, you’ll see if your close attention during past weeks has paid off as you confirm your grammar knowledge with the answers to the two grammar questions I posed last Friday. And, maybe you Outlander fans will be able to gauge just how obsessed you are with the show by testing your thoughts as to which characters spoke which words in which scenes of the episodes referenced last time. Grammar Alert! Hey, look at that. What’s the term for the omnipresent type of word highlighted in previous Five-Phrase Friday (FPF) posts? FPF 4 and FPF 6 use or mention it, and FPF 8 uses it in one of the featured phrases. I’ve mentioned before that I tend to use a lot of these in my writing, especially my poetry. Final hint: This grammatical element shows up every week in another way as well. Answer: compound modifier, or compound adjective. Often hyphenated, it’s a two-word adjective placed before the noun it affects. For example, “Five-Phrase” in “Five-Phrase Friday.” How’d you do? Grammar Note: You may notice in some of these [Shakespearean insults] a type of word similar to the one hinted at above in the “Grammar Alert!” These words from column or group 3 fall distinctly into the noun part-of-speech category. What is the name for this type of noun? Answer: A compound noun, of course! Two words in one. For instance, “rats” + “bane” = “ratsbane.” Did you get that one? Of course, both the compound noun and the compound adjective/modifier belong to the larger class of compound words. If you recall from your own grammar lessons, there are also such things as compound sentences–two independent clauses, or complete thoughts, in one, where each could stand alone. Featured this week are the answers to the question about the Outlander phrase that samples one word each, in order, from episode 112 “Lallybroch”/episode 114 “The Search,” episode 105 “Rent,” and episode 107 “The Wedding” of the show’s first season. Do you Outlander fans know which character(s) spoke each word in the invented insult “You muckle whey-faced coof“? The adjective “muckle,” meaning big, tall, or great, shows up in several episodes; we’ll focus on the main three. Not mentioned last week is its presence in ep107 in the stables. 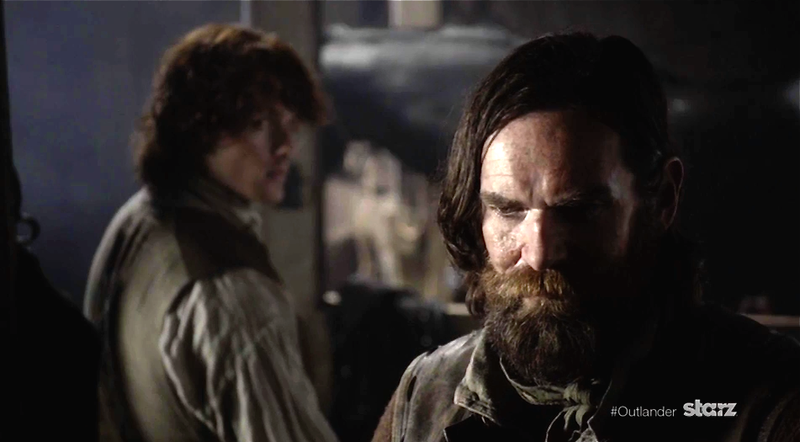 Murtagh Fraser worries aloud to his godson Jamie about his “red hair and muckle size, wearing Fraser colours” for the wedding–given that the lad has a price on his head. 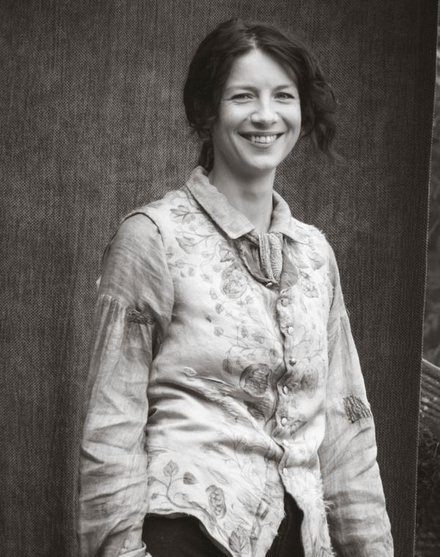 Jenny Fraser similarly criticizes her brother Jamie for diving into the mill-pond to try to fix the mill-wheel in ep112 “Lallybroch”: What the hell were ye doin’, you muckle great sumph (i.e., oaf)?! Have ye not grown up a bit?” And sure enough, it’s because he wandered off just when the redcoats were approaching the property of the laird who still has that price on his head. But, I mean, look at that bod. There’s a wanted man if ever I saw one. For more about the original bawdy song “The Reels O Bogie” and the version of it she sings in the episode, see my detailed posts on the subject here and here. Okay, so those are the muckles. Next, the compound modifier “whey-faced,” which means pale-faced like the color of whey, shows up in ep105 “Rent.” It’s when Torcal, the tenant who can’t pay the rent he owes the Laird of Clan Mackenzie (Colum Mackenzie), reacts in the tavern to Dougal Mackenzie’s display of Jamie’s scarred back from flogging by the British. Clearly, Dougal’s speech in Gaelic for the Jacobite rebellion and the visual aid (visuals are helpful, don’t you think?) has the intended effect on this man. Torcal mutters across the table to a neighbor that he’d rather die than “let that whey-faced sassenach use me so.” Oddly enough, Black Jack Randall is a bit swarthier than the stereotypical sassenach–maybe the “whey” of his complexion has black pepper or soot in it to match the color of his soul. Last we have the slang noun “coof,” a Scots English word for a dolt, or stupid fellow. This one occurs in the wedding night scene of ep107 where Rupert Mackenzie and Angus Mhor burst into the honeymoon chamber to check on the newlyweds’, er, progress in consummating the marriage. “I told ye to stand back, ye coof,” Rupert digs into Angus. Then, after a brief discussion in which Rupert explains their presence, Jamie throws them out. On the way, Angus fires back at Rupert, “Now who’s the coof? They’ve still got their clothes on!” and then proceeds to confess that he just wanted to see Claire’s breasts. Did you guess all five of those correctly? Perhaps I’ll pull from the book next time. But how about a hand for those show writers in their use of authentic Scots, Gaelic, and 18th-century English vernacular! Tapadh Leibh, I say! What are some of your favorite lines from this show or others? Ta-ta for now, wordsmiths, superfans, and readaholics (we’ll explore what kind of word that is next time)! “. . . of outrageous fortune!” (Hamlet, the “To be, or not to be” speech): These we suffer. First, let me say this week’s English phrase celebration covers all of my blog’s major focus areas: language play, animals, Outlander, free speech, reading, comedy, poetry, grammar, creativity, education, TV, and even Shakespeare! This post has it all–something for each reader. So enjoy! Ordinarily I don’t condone name-calling, even in jest (unless you really know that the person can take it). But since it’s William Shakespeare we’re talking about, and since many words he used in his insults have fallen into disuse lately, what the heck! Let’s have some fun. This week’s phrase-praising post deals in threes by looking at (1) bawdy insults featured in Shakespeare’s plays, (2) Outlander TV show insults identified by episode, and (3) a review of Five-Phrase Friday grammar lessons–your favorite! Several online sources deal with Shakespearean insult creation, but MIT provides a succinct set of lists in three columns for your three-step, mix-and-match pleasure. They call it the Shakespearean Insult Kit. How it works: Take an adjective from column 1, one from column 2, and a noun from column 3, put them together, and ‘zounds! Your own tailor-made Shakespearean insult. This week’s collection of phrases comprise some of my favorite bawdy-leaning combinations from the kit. Grammar Alert! Hey, look at that. Did you notice in that sentence the omnipresent type of word highlighted in previous Five-Phrase Friday (FPF) posts? FPF 4 and FPF 6 use or mention it, and FPF 8 uses it in one of the featured phrases. I’ve mentioned before that I tend to use a lot of these in my writing, especially my poetry. Final hint: This grammatical element shows up every week in another way as well. Oooh, I like that last combo: “You venomed toad-spotted wagtail!” Or how about “Thou currish beetle-headed ratsbane!”? Now that’s a hybrid mutant! Grammar Note: You may notice in some of these a type of word similar to the one hinted at above in the “Grammar Alert!” These words from column or group 3 fall distinctly into the noun category. What is the name for this type of noun? Of course, our protagonist Claire prefers her own 20th-century insults not fit for general consumption, and then there’s all that Scottish Gaelic stuff. . . . All in good time. Do you Outlander fans know which character(s) spoke each word in the insult? Quiz next week. No, really. Next Friday I’ll (1) confirm the character and scene for each word in the above insult, (2) present select lines from Outlander for my phrases, and (3) unveil the answers to today’s 2 word-type questions. By the way, you can vote for your favorite movies, music, TV shows, and players for the People’s Choice Awards 2016 starting this week. Cheers, you itinerant pretty-minded logophiles!